An adult in the city has been ID'd as being contagious with measles from Jan. 9 to Jan. 14 after having traveled internationally, according to Denver Public Health. 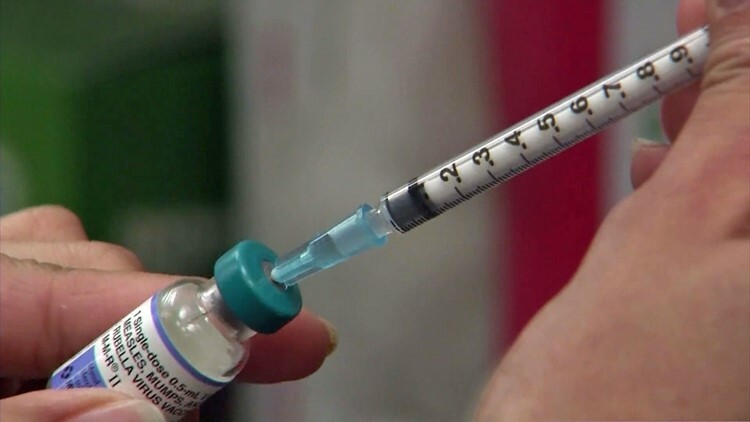 DENVER — An adult in Denver has a confirmed case of measles, making it the first confirmed case of the disease in Colorado for 2019, according to Denver Public Health. Denver Public Health said on Wednesday that they're notifying the public because the adult, who'd recently traveled overseas, was confirmed as contagious with measles from Jan. 9 to Jan. 14 of this year. In a press release, the Denver and state health department said they were working to notify anyone who may have been exposed to measles from this person. Between the hours of 10 a.m. and 1:30 p.m. Between the hours of 10 a.m. and 2 p.m. Between the hours of 8:30 a.m. and 12:30 p.m. Between the hours of noon and 9 p.m. Between the hours of midnight and 3:30 p.m. If you or someone you know were in these places at these times, it is a good idea to keep a vigilant eye out for measles symptoms and to call your doctor and check if you're up to date on your measles vaccinations. You're at a lower risk, according to Denver Public Health, if you were born before 1957, have already had measles or have had one or more measles shots. People who were not in the above locations at the specific times are at no risk for measles. If you could have been exposed or are showing symptoms, please call your health care provider immediately over the phone and explain what's going on to them. If you don't have a health care provider, it's imperative you call an urgent care center or an emergency department. If you need additional help or information, reach out to CO-HELP at 303-389-1687. Denver Public Health wants anyone who's showing measles symptoms to stay away from child care facilities, schools, work or even public. The disease may be spread to others. Denver Public Health asks that people check over their and their children's vaccination records against the recommended schedules (which can be found at this link) to make sure they're up to date on the measles, mumps and rubella vaccines.